Joseph Milana’s insightful collection of idiosyncratic philosophical essays entitled “On Hope and Knowledge: A Skeptic’s Response and Other Reflections” (published by Archway Publishing) shares Milana’s ruminations on science, religion, knowledge and philosophy, encouraging skeptics and seekers alike to discover their place in the world. 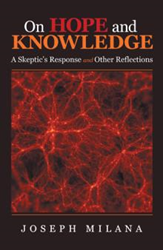 The book is available for purchase at: https://www.amazon.com/Hope-Knowledge-Skeptic%C2%92s-Response-Reflections/dp/148086255X. Appealing to the curious, Milana’s writings explore the purpose of people in the world, through the lenses of philosophy, history of science and ethics. Milana believes that people’s lives are an effort to synthesize various elements together to find their place in the world. Throughout the discussion, Milana works to keep it current while spanning the millennia by connecting with great thinkers of the past. At the same time, he seeks to acknowledge latest advances in fields such as physics, biology and psychology, and connect with common humanity as expressed across the ages. Joseph Milana was born in Brooklyn, New York, and he received his doctorate from the Institute of theoretical physics at SUNY at Stonybrook. After pursuing an academic career, he moved with his family to San Diego, California, in 1996, where he ultimately became a chief scientist at FICO and then at Opera Solutions. He currently owns a company that leverages statistical models and artificial intelligence to make investments in the derivatives market. Milana has also published numerous scientific articles, and has been the inventor or co-inventor on a number of patents.